Vladimir Vernadsky was a renowned Russian crystallographer, mineralogist, geochemist and geologist. He is best known today for his research on the “noosphere” and the way it affects the biosphere. Developing in the 1920’s a similar concept to the “Gaia theory” or the “Gaia principle” proposed by chemist James Lovelock in the 1970’s, Vernadsky was a man ahead of his time. He was also responsible for laying out the foundation for the study of geochemistry. Vladimir Ivanovich Vernadsky was born on March 12, 1863 in Saint Petersburg, Russia. His father was a university professor teaching political economy and the editor of the journal “Economic Index”. His mother was a Russian noblewoman and the daughter of a general. Vladimir’s childhood was spent in Ukraine and he studied in Kharkov for a brief period of time. When the family moved to Saint Petersburg, he continued his studies at the Saint Petersburg Grammar School. Here, he developed an interest in science, specifically in natural sciences. In 1885, Vernadsky earned his degree from Saint Petersburg University’s Department of Natural, Physical and Mathematical Faculty. He trained under the famous Vasily Vasilyevich Dokuchaev, who was known as the founder of soil science. Vernadsky travelled abroad to prepare himself for a future professorship and he traveled to Naples and studied under crystallographer Scacchi. He later decided to go to Germany to train under Paul Groth. Groth had developed a piece of equipment that helped analyze the thermal, optical, electrical and magnetic properties of crystals and Vernadsky enjoyed learning to use this modern machinery. He also used the physics lab of Professor Zonke, another crystallization expert. On returning from overseas in 1898 Vernadsky accepted a position as lecturer at the University of Moscow where for the next twenty years he taught mineralogy and crystallography. He earned his master’s degree 1n 1891 based on a study of the silliminite group and the role of alumina in silicates. His doctoral thesis in 1896 concerned “Phenomena of gliding in crystalline substance”. He was the first in Russia to introduce mineralogical field studies for his students, the first trip taking place in the Urals in 1896. By 1909 Vernadsky had switched his interest away from crystallography towards geochemistry. Having built up one of the best equipped laboratories in the world, he resigned his position in 1911 and worked as an academician of the Russian Academy of Sciences; he had already been elected into the Academy in 1906. In 1917, Vernadsky returned briefly as a Professor of the Faculty of Geology and Mineralogy at Moscow University before the Russian revolution and its aftermath forced him eventually to flee Russia in 1921. Vernadsky presented his famous report on the “Paragenesis of Chemical Elements in the Earth’s Crust” in front of the 12th Congress of Medics and Natural Scientists in 1910. This study laid the foundation for what was later known as geochemistry. He advocated researchers to use radioactive phenomenon in studying the history of chemical elements and in seeing the relationships between these elements. In 1909, Vernadsky established the Radium Commission, driven by his theory that radioactive substances are important sources of energy. He collected rock samples and mapped where deposits of radioactive substances could be found in great detail and the first geochemical laboratory was opened in Saint Petersburg in 1910. Vernadsky was the first person to make the concept of the “noosphere”, the sphere of human thought, more familiar. He contributed to the concept of the biosphere as it is known today and took the process one step further. Essentially, Vernadsky reasoned that there was a certain succession by which the earth develops. Geosphere or inanimate matter comes first, followed by the biosphere or biological life. Then follows the “noosphere”, consisting of human consciousness and mental activity. Each of these relate to each other, with the emergence of biological life transforming the geosphere and the emergence of human consciousness transforming biological life. Both biological life and human cognition are seen as having a large impact on the evolution of the earth. Much of his concepts were later independently developed in the “Gaia theory” or the “Gaia principle” proposed by chemist James Lovelock in the 1970s. One of the pioneers that shaped environmental sciences, Vernadsky was among the first scientists who realized that the presence of nitrogen, oxygen and carbon dioxide is a direct product of biological processes. He also published is research in the 1920’s, stating that living organisms have a large impact on how the planet evolves. He headed the Museum of Mineralogy and Geology at the Academy of Sciences from 1906 to 1921 and helped coordinate the development of the metal mining industry. He visited the Crimea in 1916, prospecting for bauxite in the Altai Mountains. In 1917, he started visualizing a new branch of science called biogeochemistry. He envisioned this branch of science would deal with living matter as an integral part of the biosphere. In 1918 he moved to Kiev and, as a member of the government, founded the Ukrainian Academy of Sciences the same year and became its first president. He also founded the National Library of the Ukrainian State. 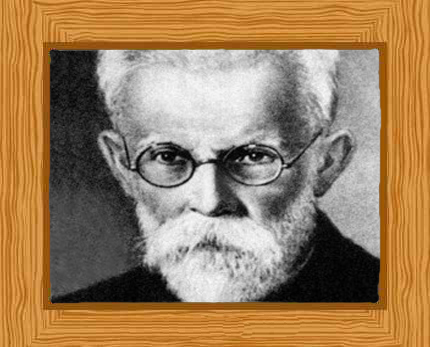 Vernadsky moved to Rostov-on-Don in 1919 before the arrival of the Bolsheviks in Kiev and in 1920 he moved to Simferopol, in the Crimean peninsula for treatment for typhoid. He also helped found and became the first rector of Taurida University in Simferopol, until his dismissal in 1921 because of the unstable political situation. In the turmoil of the Russian Revolution and its aftermath, Vernadsky left Russia with his family in 1921 after being released from a short term of imprisonment in Moscow. The family settled in Paris until 1926 when he and his wife returned to Saint Petersburg (Leningrad). His best known work “Biosferna” was published in 1926 and written while he was in Paris, consisted of three parts. The first two are long scientific essays proposing that life has been a transforming geological force on our planet. The first 67 chaptered essay, explained the “Biosphere of the Cosmos” and second 160 chaptered essay detailed “The Domain of Life”. The third shorter part discussed “the noosphere”. Vernadsky’s other notable published work is “Geochemistry”, published in 1924. He also worked with Marie Curie and published two works together, “The Living Matter in Biosphere” and “Human Autotrophy”. In later life, Vladimir Vernadsky continued to refine his “noosphere” theories and attended many scientific meetings. He was also an adviser for the Soviet atomic bomb project. He married Nataliya Yehorivna Starytska in 1887 and they had two daughters, Nina and Nyuta and a son, Georgi. He moved from Saint Petersburg (Leningrad) to Moscow in 1935. Vernadsky died on January 6, 1945, aged 81 in Moscow.